The Eastern Garbage Patch (EGP) is a floating island of trash twice the size of Texas on which the Sirens of Greek mythos lured curious scientists to their oceanic demise. Not. Quite a few misconceptions persist about the EGP, the section of the Great Pacific Garbage Patch located between California and Hawaii. A Google image search for the EGP brings up photos of trash mountains and people canoeing through rivers densely packed with plastics. As Nick Mallos ’07 will tell you, these aren’t accurate representations of the EGP. Its reality is much more complex than an island of trash, says the marine scientist for Ocean Conservancy on the Project Kaisei expedition to the patch last August. After the expedition, which sought to shed light on one of the most pervasive legends of our time, Mallos might empathize with Discovery Channel’s Myth Busters. So let’s get some facts straight. In the Pacific Ocean, there are four major rotating ocean currents called gyres. When fishing nets or consumer products like laundry baskets or water bottles enter the ocean, the plastics are caught in the gyres. The wind and wave action of all this spinning and churning causes these plastics to break down into smaller bits of plastic—to the point where they become microplastics (literally, microscopic fragments of plastic). Even biodegradable items won’t biodegrade in marine conditions, says Mallos, since biodegradation requires heat and pressure. Instead of breaking down into essential compounds, the items break down mechanically, simply becoming smaller pieces of the same material. These microscopic bits of plastic are the main issue in the EGP. Crews like Mallos’ commonly encounter larger items like nets that have gathered several thousand pounds of debris. More commonly though, these now-brittle items will have worn down into microplastics, which present more challenging problems than a mythic island of floating garbage, mainly due to their size and high concentrations. Animals, particularly filter feeders like jellyfish, die from ingesting high volumes of these plastics. One theory is that these animals mistake the plastic particles for phytoplankton, Mallos says. In the patch, plastics outnumber plankton by a ratio of 6 to 1. Mallos’ crew counted more than 17,000 pieces of plastic within four days. Yet what happens if a fish ingests these microplastics and a human eats the fish, Mallos wonders. Groups like the National Oceanic and Atmospheric Administration are researching this question thoroughly, with assistance from the data collected by Mallos and other scientists, though there are no currently published results. Due to the inherent uncertainty of these environmental threats, the Ocean Conservancy and similar advocacy groups pursue multifaceted approaches. Mallos will soon continue research, as the Ocean Conservancy is exploring potential expeditions to the waters surrounding the Palmyra and Johnston Atolls or a voyage to the South Pacific from the Cook Islands to Tahiti. In addition to further exploration of plastic concentrations and their effect on marine wildlife, Mallos’ team promotes legislation to regulate disposal of plastics, works with industry to ensure environmentally friendly products are manufactured and educates consumers about potential solutions, like using reusable water bottles or reducing the use of single-use consumer goods. It is this last effort, aside from his scientific inclinations, that really interests Mallos. “You know, Dickinson throws around the ‘engage the world’ slogan a lot, but it’s really fundamental in everything I’ve done,” says Mallos, who majored in biology. “It’s instrumental in the career path I’ve chosen. [Biology] professor Tom Arnold encouraged me to conduct field research in Turks and Caicos, instead of studying abroad in Australia, and that shaped the direction of my career.” After Dickinson, Mallos earned an M.S. in environmental management from Duke University, focusing on coastal environmental management. 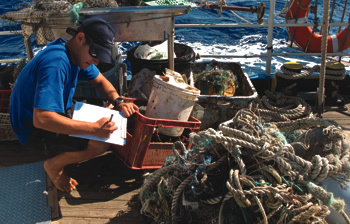 It has been important to Mallos to continue to engage the world by educating consumers, using findings from his current field research at the patch, which tests concentration models created by other scientists and catalogues marine debris. Mallos is down-to-earth about these changes. He isn’t big on preachy or extremist environmentalism that accuses people of being “the problem” and fails to provide useful information. “I think it’s essential to educate, not preach,” he says. “It’s not that people don’t care about the ocean, but rather that it is the one place on earth that is most alien to people. I’ve talked to people for five minutes and seen the transformation from a person not knowing about the issue of ocean trash to a person motivated by this new knowledge to see change. This entry was posted in Eastern Garbage Patch, Environment, Marine Environment, Oceans and tagged biology, Eastern Garbage Patch, environment, marine environment, Nick Mallos, ocean, Ocean Conservancy, Project Kaisei. Bookmark the permalink.